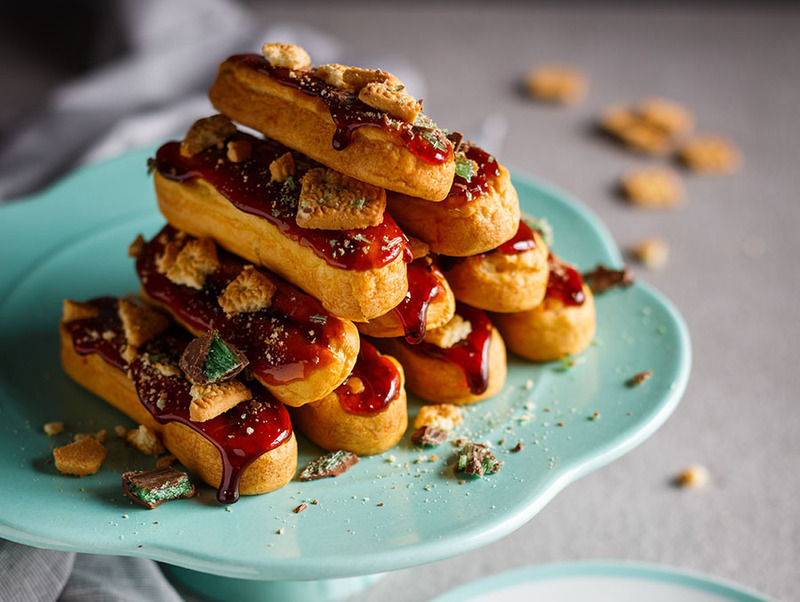 Is there anything more South African than the classic peppermint crisp tart? 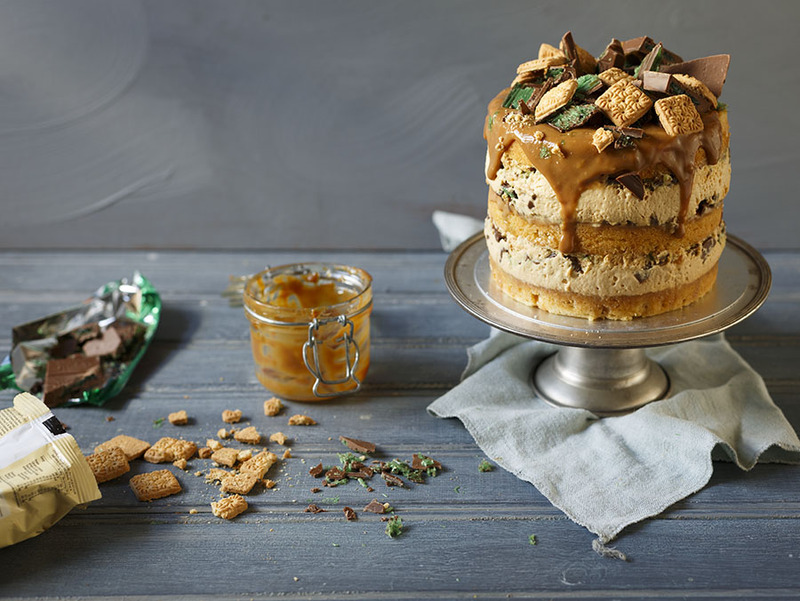 Well, I hope this Caramel Peppermint Crisp Cake comes close! 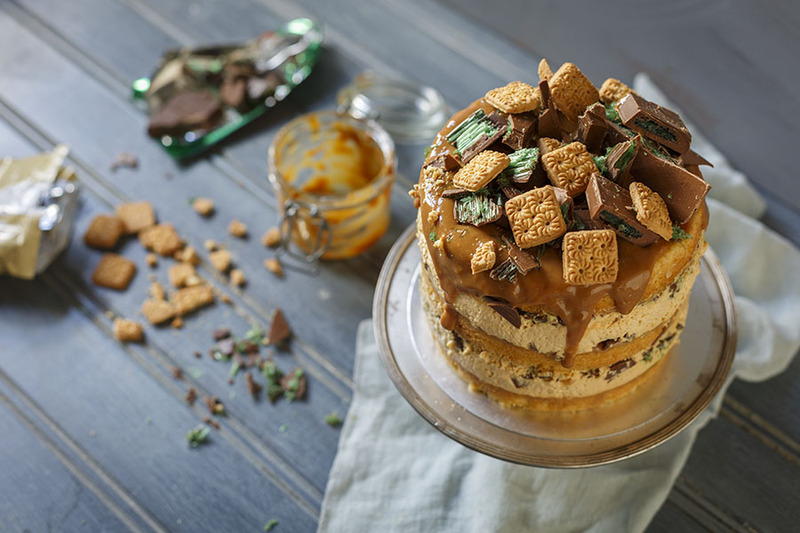 I’ve basically made a hobby out of coming up with new riffs on the combination of tinned caramel, whipped cream, coconut biscuits and peppermint crisp – cakes, ice cream sandwiches, fridge cakes – and I’ll probably come up with a few more creations to add to that, but in the meantime, this Caramel Peppermint Crisp Cake is my favourite! 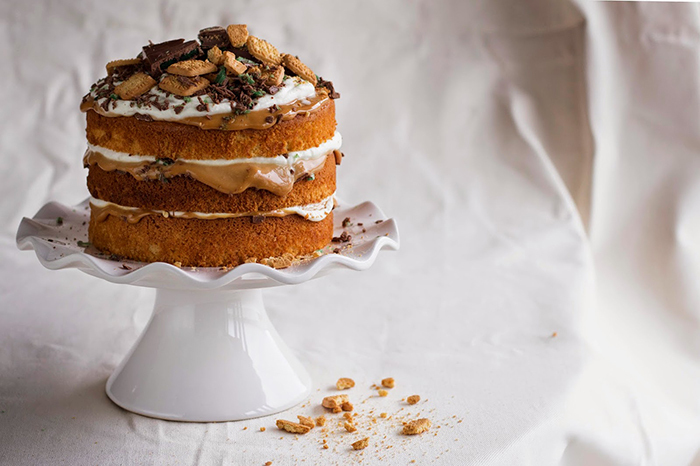 Layers of coconut sponge cake, light and creamy mousse made from tinned caramel, flecks of crushed up peppermint crisp and it’s all covered in more of all of that! While I realise I might upset quite a few purists, not for the fact that I turned a tart into a cake, but that I use whipped cream in mine. Guys, we need to sit down and talk about that Orley Whip nonsense. It needs to stop. True friends don’t let friends eat Orley Whip. (Loophole: unless you’re a vegan friend, then, by all means, go ahead and get your fix). 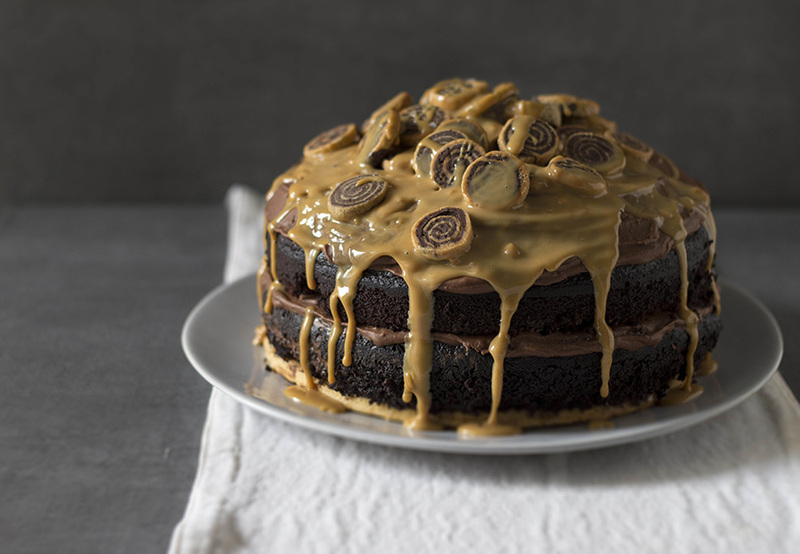 I made this Caramel Peppermint Crisp Cake for the September issue of Essentials Magazine – they’ve given me a page in every issue called #KateBakes and they’ve been mad enough to basically let me loose and make whatever my heart desires! 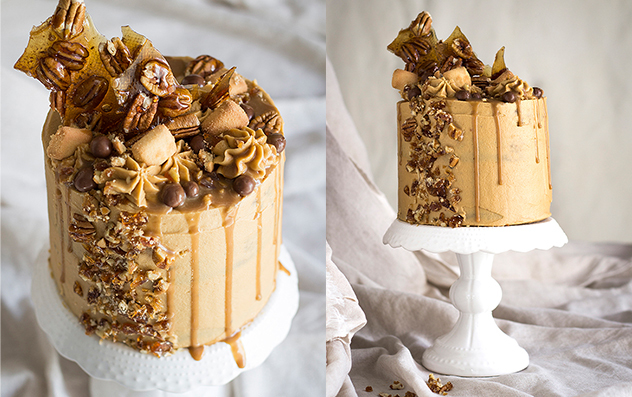 So this month, my heart desired a big fat decadent cake with a hint of local heritage and something that you can take to a braai. Because if you go to a bring ‘n braai and there’s no peppermint crisp tart, was it really a braai after all? Preheat the oven to 170C and line 3 x 20cm springform tins with baking paper. Beat the butter, caster sugar, flour, baking powder, coconut and salt together on a low speed until a sandy texture forms. Whisk the eggs and coconut milk together in a jug then slowly add to the dry ingredients while the mixer is running, to form a batter. Divide the cake batter evenly between the prepared tins and bake in the preheated oven for 20-25 minutes or until a skewer inserted comes out clean, and the cakes are golden. Allow to cool a little in the tin before turning out onto a cake rack. Trim the cooled cakes by levelling the tops. Place one cake layer back inside one of the cleaned springform cake tin. Next, make the mousse; sprinkle the gelatine over the water and allow to bloom. Microwave in short bursts until just melted the stir in half the tin of cooked condensed milk (reserve the rest), vanilla and salt. Fold in the cream until no streaks remain. Spread the remaining caramel on top of the sponge then pour half of the mousse on top. 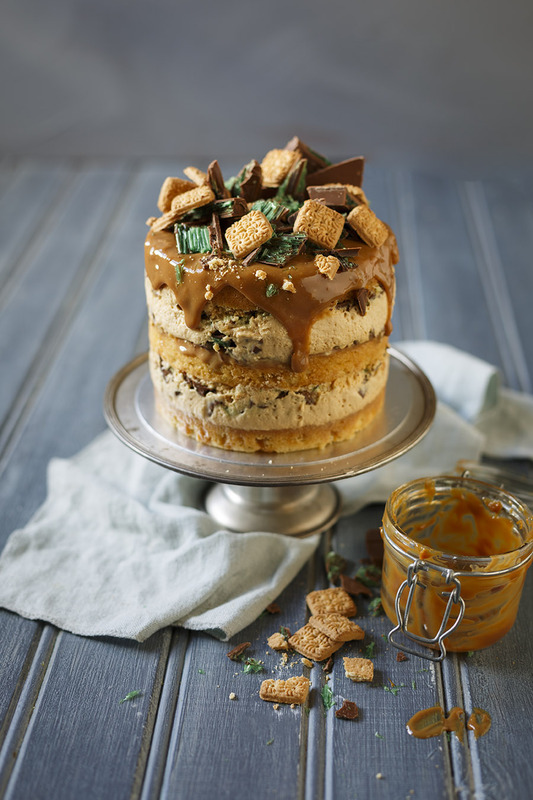 Crumble over 1/3 of the peppermint crisp and biscuits and top with another cake layer. 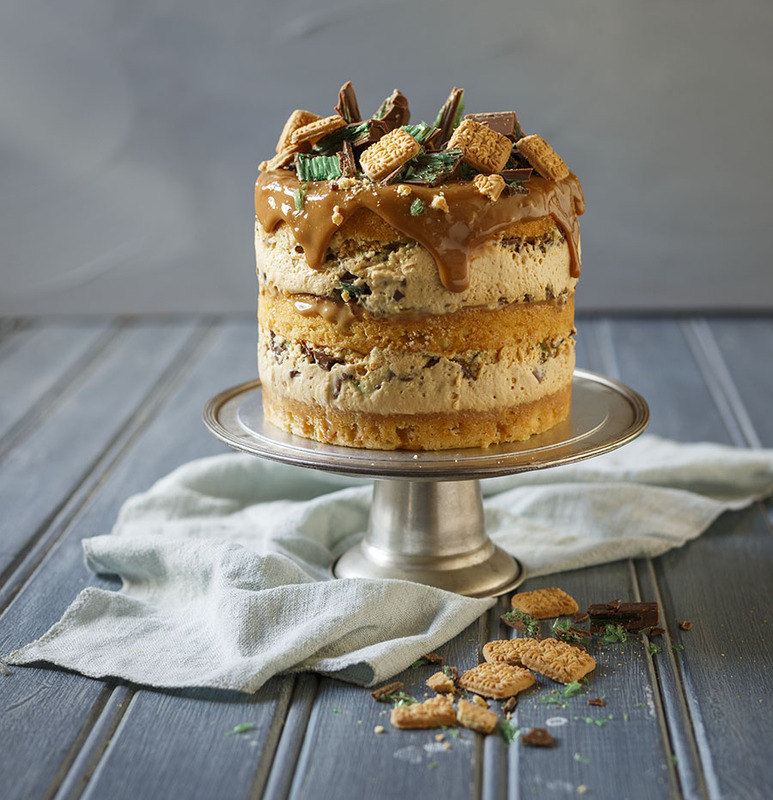 Repeat with the remaining caramel, mousse, peppermint crisp and biscuits, ending with a cake layer. Refrigerate for 2 hours or until set. To unmould, run a warm palette knife around the edges. 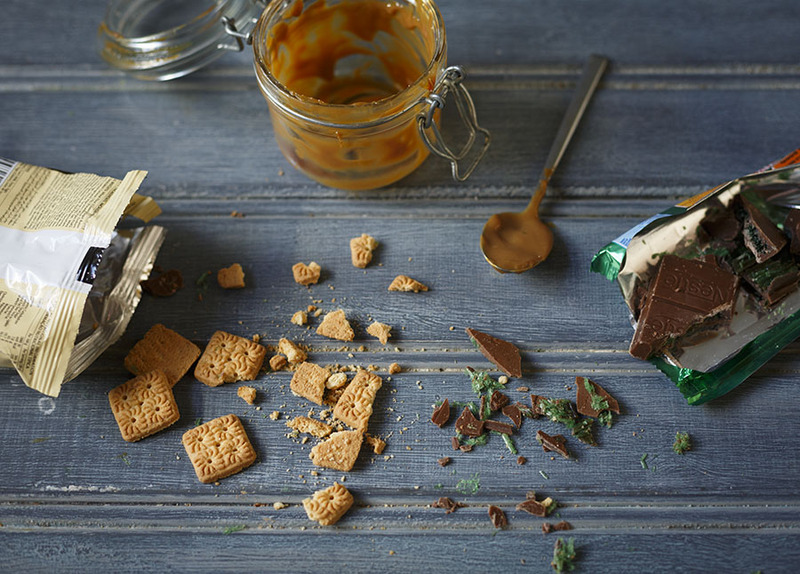 Decorate with peppermint crisp shards, tennis biscuits and caramel. Thank you for this stunning recipe. One of my all time favourites to make even though i am diabetic.. my family loves peppermint tart. I shall certainly be making this. Must it be boiled caramel or may i use caramel treat? I am so excited ? cant wait to make this. Lol.. i do too.. i made it .. yay tasted fabulous. .not as neat this because my tin was too big to stack but getting proper size and then i am making it again..
Also in method it mentions milk as well as coconut milk so i am a bit confused. This looks absolutely amazing….Will definitely give it a go.Thank you. If i don’t have a springform pan how would the pouring of mousse work? Hi Lydia! It’s do-able 🙂 I would simply assemble the cake on a plate or cake stand, but make a collar for the cake using baking paper, acetate sheets or foil. Then layer the cake inside the collar. The collar will give the filling support until it sets. Hope that helps! 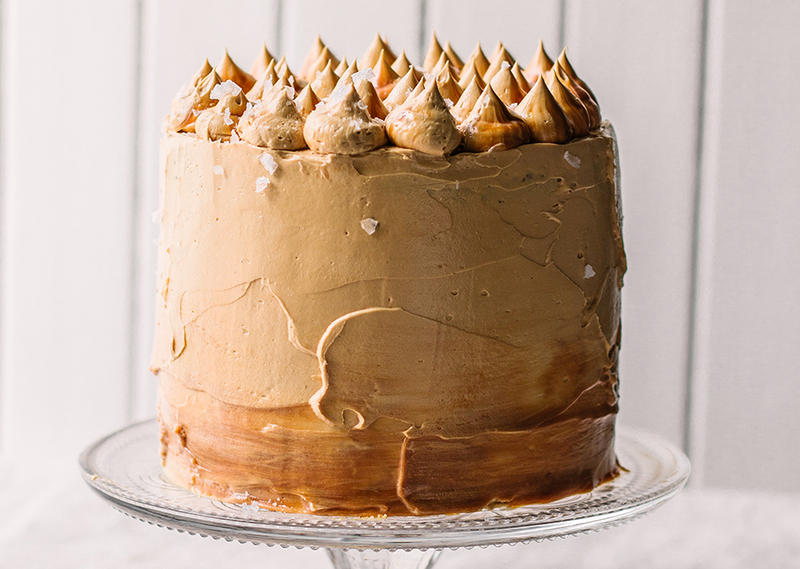 Will do so – just on the making of the mousse – you only use half a tin with the gelatin and 500ml cream and the other tin and a half you use to spread on the cake layers? This sounds amazing! Does the peppermint crust dissolve in between the layers or does it keep its crunch? This sounds amazing! Does the peppermint crisp dissolve in between the layers or does it keep its crunch? hi, so I’m attempting to make this for a bbq (South African Braai) today. I had some problems with the assembly of the cake. The cream was becoming runny very fast so I had to assemble the bottom part, leave it in the fridge overnight with the mouse and I will continue today. My question was whether one can make the mouse ahead and let that set, and afterward smear it on to the cake? Also, I used a springform, but the cake batter leaked from the bottom once it was in the oven, any suggestions on this?